From among the dozens of models of dryers available for shoppers to select from in the market today, the FASE7074LR catches the eye with its flashy, show-stopping red exterior finish. On the feature side, this model has for example, DrySense Technology, Frigidaire's version of sensor cleaning wherein all items to be dried are done in a precise manner, so that everything is dried thoroughly and evenly, with wrinkles noticeably lessened. Moreover, its Frigidaire-trademark Ready Steam feature has items smelling and looking fresh with wrinkles dramatically decreased, ironing won't really be a necessary chore. Advanced features are built-in the dryer's mechanism, ensuring consistent drying results for any item dried in it. DrySense Technology, a trademark feature in Frigidaire dryers, is the manufacturer's version of sensor technology. The machine detects the amount of moisture in the load, so that settings are automatically adjusted, ensuring a more precise drying process, with items that come out less wrinkled and evenly dried. Another mechanism installed in the dryer's interior is the Sanitize temperature settings, which has given it an NSF Certification. With the use of this temperature setting, 99.9% of bacteria and other harmful elements are removed from all items being dried. 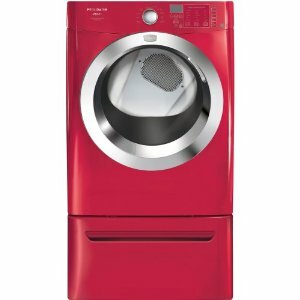 The flashy red finish of this model is something unique in appliance colors. The control panel is neatly located on top of the dryer's front door, with controls so easy to use. The buttons are arranged in orderly fashion, so there is no need to be intimidated. The interior drum of the dryer is made of stainless steel material, which makes it rust and chip proof. The 7.0 cubic feet capacity of the tub also puts the dryer in a competitive edge compared to other dryers with the same size. The interior also has a built-in light that makes it easier for the use to see what's inside the tub. The Control Lock option provides users with the assurance that settings already inputted will not be tampered while the machine is in operation. Compared to other branded dryers with right about the same features, the price for this model is noticeably higher.